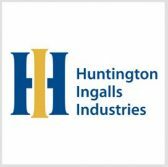 Huntington Ingalls Industries‘ Newport News Shipbuilding division has installed a more than 80-foot caisson fixture inside the Joint Manufacturing Assembly Facility located in Virginia. The 400-metric-ton structure is scheduled to reach full operational status later this year to support the construction of Virginia-class submarine Utah‘s bow module, HII said Thursday. HII opened JMAF last year to serve as a venue for Newport News Shipbuilding’s production work on submarines and aircraft carriers. The company produced a time-lapse video that illustrates the mounting process.